I’ve been designing and developing WordPress themes since 2008. As a result, I’ve created a lot of themes. These are my favorites. Unlike most web design trends, minimal design never goes out of style. I work to find clean and legible fonts that pair together seamlessly. I strive to create layouts that are familiar and fresh at the same time. Creating a beautiful, practical and unique minimal design is the ultimate challenge. Minimalism also translates to code. I strive to develop themes with as little code as possible. That’s more difficult than it sounds. I avoid using excessive scripts, overly flashy effects, unnecessary image files and as few custom options as possible. When options are needed, I integrate them seamlessly into the native WordPress customizer. Developing minimally keeps themes light, easy to customize and fast when it comes to load times. Less is more when it comes to the design and development of WordPress themes. I make themes that don’t require any knowledge beyond the basic usage of WordPress itself. Ideally, a WordPress theme should be ready to use immediately upon activation. It should not be reliant on several options, frameworks, shortcodes or plugins to function as advertised. If some setup is required, it should be accomplished within minutes using familiar WordPress settings. In addition, the native WordPress customizer should be utilized for all theme options and setup. WordPress is placing a huge emphasis on their customizer, introducing new features with each update. In the future, all themes should utilize the customizer instead of bulky custom options panels. The themes I develop are open source. That means the code is freely available to be taken, copied, reused and distributed as desired — preferably with credit to the author. I believe in furthering the progression of web technology, and that’s accomplished by the thousands open source developers that contribute their talents online. I don’t encrypt or attempt to protect the code I write. In fact, I make it as easy to understand and modify as possible. So, now that you know where I’m coming from, the following WordPress themes were created with those principles in mind. My personal site uses the Portfolio Theme. This theme has run the gamut of re-designs, re-builds and revisions since its original release in 2009. The latest 2017 iteration is everything I’ve ever wanted in a great WordPress portfolio theme. It features a clean and minimal design. The focus is entirely on the content and work. It has a unique, but intuitive layout. Multiple portfolios and slideshows can be created with ease. The typography is crystal clear, and the mobile experience is a pleasure to behold. In addition, the theme setup process should only take a matter of seconds. 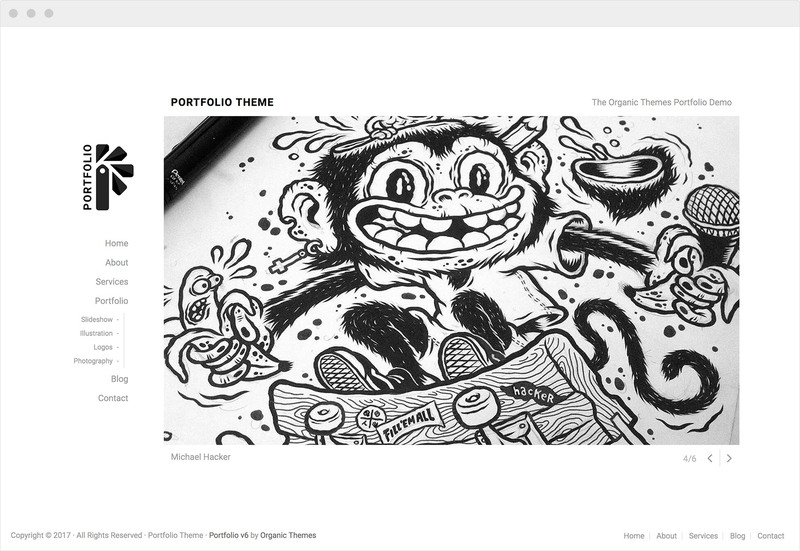 The Portfolio Theme has evolved significantly over the past 8 years. Throughout that evolution, it has remained one of my favorite WordPress themes. GivingPress Pro is a WordPress theme designed for nonprofit organizations. The theme powers the GivingPress website builder. In addition, it’s the most robust theme I’ve ever created. Even with an abundance of features and integrations, GivingPress Pro provides a simple and intuitive website building experience for nonprofits. With GivingPress Pro, we created a WordPress theme for people that don’t know how to use WordPress. The result is a theme that can be entirely controlled from within the WordPress customizer — rendering the old WordPress admin experience obsolete. I believe it’s a big step in the future of WordPress themes. Although the design might not be revolutionary — it is professional, highly customizable and very difficult to break. As a result, the GivingPress Pro theme looks great under almost any circumstances. If you’ve glanced at my blog for more than a few seconds — my love of surfing is obvious. The Swell Theme is my nerdy homage to the sport I love. I even created a separate site and brand for the theme, complete with pictures of Kelly Slater. While the theme was created with surfing on the brain, there is nothing about the Swell Theme that makes it particularly suited for surfers. However, the Swell Theme is an all-around, tubular theme that is flexible for your needs — dude. My favorite aspects of the Swell Theme are the bold design, clean typography and blog layout. The Structure Theme was originally released in 2009. It was completely re-developed for the fourth time in 2016. The latest iteration stays true to the minimal design and layout on the original, while adding all the latest WordPress functionality and features. Structure is a solid theme. Structure features a bold minimal design, responsive 3-column layout and endless color options. The content color automatically changes to visible on top of darker background colors. I love the flexibility of this theme. When used for online magazines, the Structure Theme really shines. The Origin Theme is very simple — intentionally. 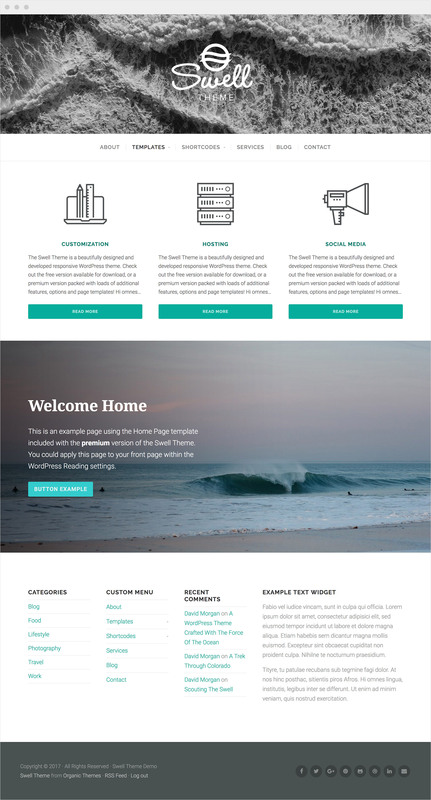 It’s a WordPress starter theme. That means, we use the theme as the foundation for building new themes. As a result, it’s constantly being updated with the latest WordPress features and functionality. In addition, whenever we learn a more efficient way of coding something, we introduce that standard into the Origin Theme. So while the theme might not be ground-breaking, its simplicity and ability to expand upon make Origin one of my favorite WordPress themes. It’s a great starting point for any WordPress theme developer. Some website owners change WordPress themes like they change t-shirts. However, a great WordPress theme shouldn’t need to be changed. Maybe updated, but not changed. It should look great now, and 10 years from now. As fast as web technology evolves, such themes are difficult to find. However, the themes on this list are proven to stand the test of time — some of which have been around for nearly 10 years. They have survived the trends and grown with the technology. That’s the mark of a great WordPress theme.